2012 THREAT. 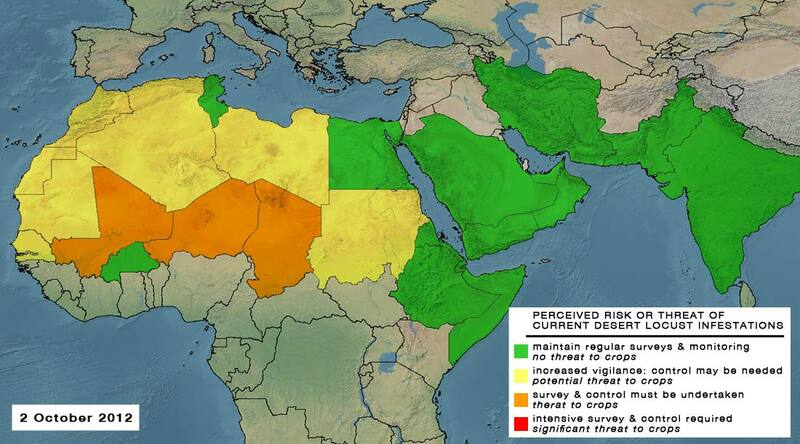 From May onwards, the Sahel in West Africa faced the most serious Desert Locust threat since 2005. More than 50 million people could be affected in Chad, Mali, Mauritania and Niger. Good rains during the summer led to unusually favourable ecological conditions that gave rise to a second generation of Desert Locust breeding in September. This caused locust numbers to increase 250-fold with hopper bands forming in October and swarms in November, coinciding with the seasonal harvest in the Sahel. If control operations are not effective in Chad, Mali and Niger, numerous swarms could leave the Sahel when vegetation dries out (November onwards) and migrate to Algeria, Libya, northwest Mauritania, and Morocco. National locust teams were mobilized for survey and control operations in Chad, Mali, Mauritania and Niger but additional assistance is needed to maintain and increase the teams. Interventions are limited in northern Mali due to insecurity and military escorts must accompany teams in northern Niger. APPEAL. In June, FAO appealed for USD 10 million for carrying out the necessary survey and control operations in the Sahel this summer. On 3-5 September, a regional technical meeting in Nouakchott, Mauritania brought together the FAO, its Commission for Controlling the Desert Locust in the Western Region (CLCPRO) and the ten member countries, the World Bank and the West African Economic and Monetary Union (UEMOA). A regional plan was updated for Chad, Mali, Mauritania and Niger from September to November. Financial requirements remain the same as the June appeal. Donors were updated about the situation in December. OUTLOOK. Control operations funded by the assistance received to date reduced locust infestations in the northern Sahel and protected crops. Consequently, only a limited number of swarms are thought to have formed, and a few small groups of adults migrated from the Sahel to Northwest Africa. Without the assistance and control, migration would have occurred on a much larger scale. Nevertheless, a greater number of locusts will be present in Morocco and Algeria for spring breeding in 2013 compared to 2012. If good rains fall, locust numbers will increase and small swarms could form that, unless controlled, could move back to the Sahel in about June 2013. *December: Groups move to Libya and Algeria; small groups in Niger.